This past week, supporters of the Palestinian cause were once again out in full force to prove that with friends like them, Palestine needs no enemies. The target of the assorted “friends” of Palestine was the American Task Force on Palestine (ATFP), which is arguably the one Palestinian-American organization with the most clout in Washington. I’ve written before about ATFP and the hypocrisy of its critics. The latest incident that got ATFP’s opponents all worked up are two photos showing ATFP president Ziad Asali attending an event hosted by Israel’s US Ambassador Michael Oren to mark Israel’s Independence Day. Inviting Asali to this event obviously implies respect, if not outright recognition for the agenda pursued by his organization. But since the ATFP advocates the establishment of a Palestinian state through negotiations, supporters of the Palestinian cause couldn’t care less. To show their displeasure with Asali, they are circulating a pathetic petition demanding his resignation. “I recount this not to bewail my fate, or to dwell in the past. The four generations of Palestinians who have lived and died in refugee camps are the real face of the Palestinian tragedy. It is fitting and proper to honor historical truths, but also to learn the lessons they teach us. “We must work together to build a future in which both peoples can enjoy the rights, responsibilities and dignity of citizenship and self-determination. There is only one way to actually accomplish this: ending the occupation and creating a Palestinian state to live alongside Israel. Palestinians must recognize and accept Israel, which is a legitimate member state of the United Nations. The Palestinians must have one place on earth, the territories occupied in 1967, where they can live freely as first class citizens in their own independent state. There is no other way to end the cycle of bloodshed, pain and hatred has that lasted for so long. And make no mistake: it is exactly this vision of two states living side by side in peace that most of Asali’s critics reject. It’s no coincidence that the petition against Asali was drawn up by Sa’ed Atshan, a Harvard Ph.D. candidate who is a proponent of the so-called “one-state solution” that aims at Israel’s abolition in favor of a bi-national state. 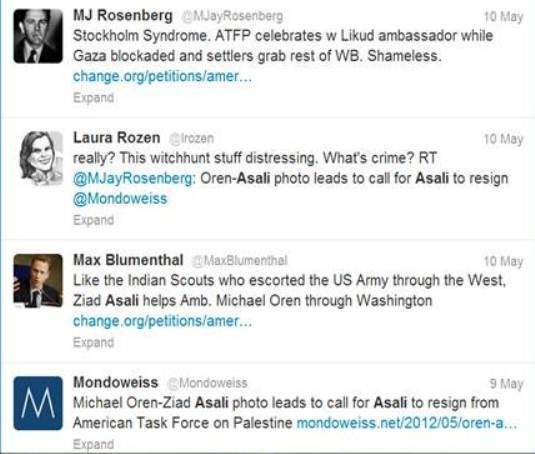 In this context, it’s interesting to note that the campaign against Asali and the ATFP is not only supported by the usual suspects from the lunatic fringes – see e.g. 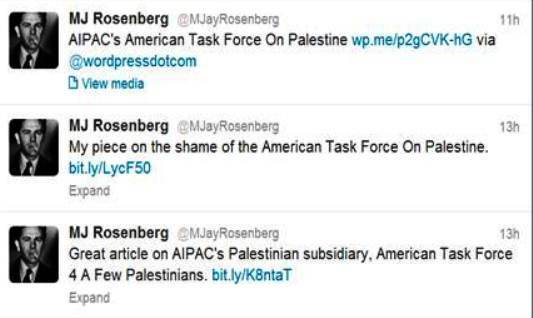 this piece at Mondoweiss, and the hate-filled comments that follow – but also by MJ Rosenberg, who is no longer with Media Matters and therefore free to write without even minimal constraints. 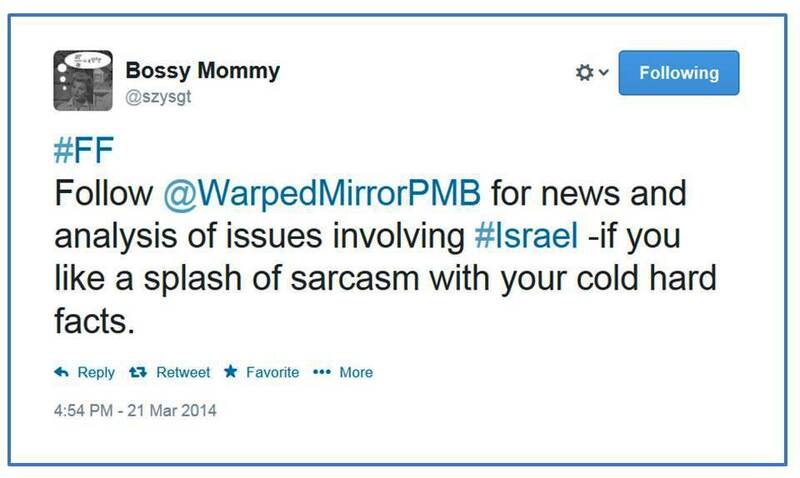 This entry was posted in Uncategorized and tagged Israel, MJ Rosenberg, Mondoweiss, peace, pro-Palestinian. Bookmark the permalink.